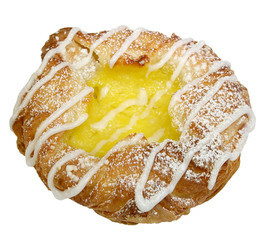 Classic Danish pastry with vanilla filling. WHEAT FLOUR (contains ascorbic acid, BARLEY malt), vegetable fat / oil (* palm, rapeseed), water, sugar, MILK, EGG, yeast, semolina (WHEAT), modified starch, WHEAT GLUTEN, salt, dried sourdough WHEAT, malted WHEAT FLOUR, emulsifiers (E471 , E472e), acidity regulator E330, flavoring (among others. vanillin), color (beta-carotene). * Certified acc RSPO.Glasyr: sugar, glucose syrup, water, coconut oil, preservative E260.